From left, Aspen High School golf team members Colter Zwieg, Jack Pevny, Dawson Holmes, Jack Hughes and Dominic Lanese stop for a photo during Wednesday's practice at the Snowmass Club. The Skiers will compete Monday and Tuesday at the 3A state tournament in Boulder. At stake this week for the Aspen High School boys golf team is more than a trophy. For the players, it’s about the legacy they could leave behind by doing what no others in program history have accomplished: win a state championship. And that opportunity is here for the taking. The Class 3A state tournament gets underway Monday and concludes Tuesday at Boulder Country Club. 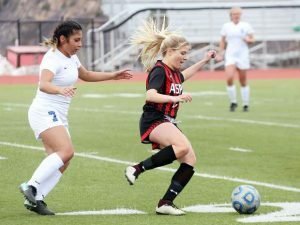 According to the official Colorado High School Activities Association stats, which use the iWanamaker program and ratings system, Aspen is the top-ranked team in the state in any classification. The Skiers’ season has been as dominant as it gets, winning the team title in nine of their 10 tournaments this fall, including at regionals. All 10 times it’s been an AHS golfer who finished as the low medalist. 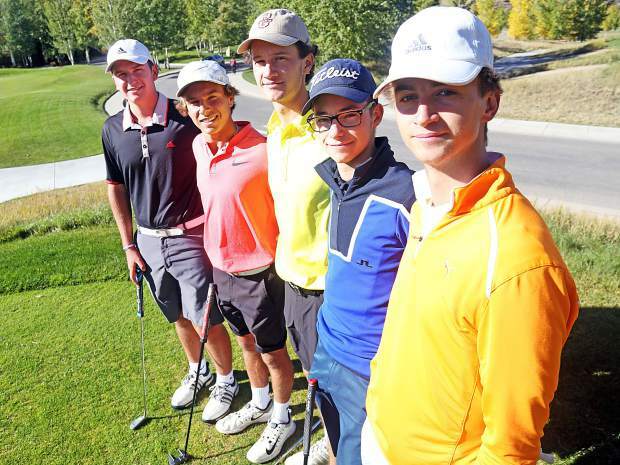 Now, they have 36 holes to prove they are the best in 3A, and not just the Western Slope. Is this the best golf team in Aspen High School’s history? A state championship Tuesday would likely put that discussion to rest. As good as the AHS program has been — this fall marked its 10th straight regional championship — it has never won a state title. The 2011 team is certainly considered among the best in school history, having finished runner-up in 3A. That team was led by a fifth-place finish from Jesse Beetham, with Ryan Smith tying for sixth and Clayton Crawford tying for 17th. In 2015, when the current seniors were freshmen, then-senior Will Hazen tied for second as an individual. This was only two years after Basalt High School’s Tristan Rohrbaugh won the state championship (BHS has never won a team title). What makes the 2018 Aspen team so special isn’t just its raw talent but the unmatched depth it has. Entering the season, it was a six-player competition for the four regional spots, and that battle has only strengthened the team. Arguably the best golfer in AHS history is Eri Crum, who played for the Skiers in the early 1990s. He is best known for having been a teammate of Tigers Woods while playing collegiately at Stanford, where he was even team captain. Crum, who founded the Boise Spine Center in Boise, Idaho, also made noise when he won the 2014 Speedgolf World Championship. As good as he was, Crum never won the high school state championship. He did, however, win the Colorado Junior PGA Championship in both 1992 and ’93. All six of Aspen’s varsity golfers this season can shoot under par. Two of them — senior Colter Zwieg and freshman Nic Pevny, the younger brother of Jack — will only get to watch this week in Boulder. With teams capped at four players each, Jack Pevny, Lanese, senior Dawson Holmes and senior Jack Hughes will contend for the school’s first state championship. Of their 10 tournaments this season, Hughes won a team-high four of them, including the regional championship Sept. 17 at Dos Rios Golf Club in Gunnison. Lanese is second on the team with a trio of wins, all coming in the first three tournaments of the season. Lanese won the regional championship his freshman year. Jack Pevny has two wins this season — including at Aspen’s home tournament — while Zwieg has the other. Despite not having an individual win, Holmes did just enough to edge Zwieg for the fourth spot. The decision was purely mathematical. All four of this year’s state golfers have been to the big dance. This exact same foursome competed in 2016, where Jack Pevny led the team by tying for 20th as the Skiers finished fifth as a group. Hughes and Lanese both played as freshmen when the team finished third, while the 2017 state team consisted of Lanese, Holmes, Zwieg and Carter Hall, last year’s surprising regional champion. Aspen finished third as a team last fall, with Lanese and Holmes each shooting 73 at Indian Peaks in Lafayette to tie for fourth. 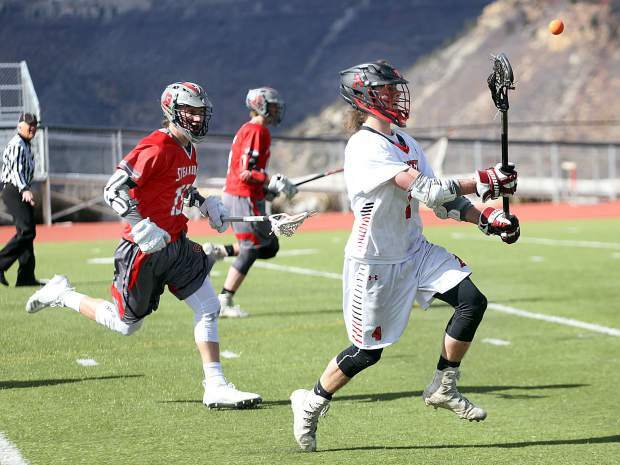 Peak to Peak edged Kent Denver in a playoff to win the state title. Of course, the Skiers played without Jack Pevny and Jack Hughes who, along with Nic Pevny, skipped the high school season to attend a golf academy in Florida. Reunited, this year’s foursome hopes to finish what it started all those years ago. All four players said this year feels different. 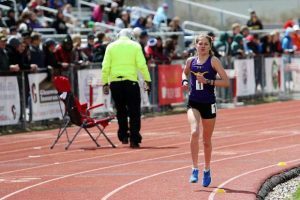 There wasn’t a strong belief they could win a state championship — either as a team or individually — in recent years, but there is little doubt this time around. Hughes, being the regional champion, will be in one of the featured groups. He’ll tee off at 9:54 a.m. from the first hole Monday morning, playing alongside Colorado Academy’s Christian Agelopoulos and Holy Family’s Jacob Mason. 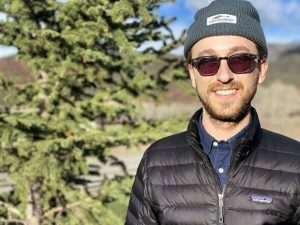 The Boulder Country Club course is mostly new ground for the Skiers, but it’s a course Hughes will see plenty of in the coming years. 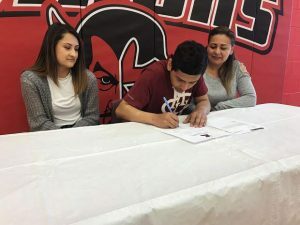 While he’s kept it pretty well under wraps, early this season Hughes committed to play golf for the University of Colorado in Boulder, meaning this week’s state tournament is both a goodbye and a homecoming, of sorts. But, before he dons the black and gold, he has unfinished business to take care of in Skier red.